“This land is your land, from purple mountain majesties, to the oceans white with foam?” — No, that’s not quite right. Anyway, what’s for certain is that North America is a place of immense natural beauty and ecological diversity — so beautiful and diverse that a few songs have been written about it. And the quickly growing ecotourism industry helps use tourism dollars to preserve these fragile and pristine natural areas — before they’re gone for good. But how can ecotourists see America’s best ecotourism destinations while minimizing the impact of their visit? What exactly is ecotourism, and why is it so important? While thinking up our ultimate ecotourism road trip — to be taken in a Tesla or Prius, of course — we answered these questions and a whole lot more. So read on to find out how you can take in all of America’s natural beauty while helping to preserve these destinations for generations to come. Let’s be honest: Ecotourism as a form of environmental stewardship may seem like a bit of a contradiction. After all, the act of traveling consumes resources, not to mention the resources consumed in the building and upkeep of visitor facilities and by visitors during their stay. But it doesn’t have to be that way. Every ecotourist can minimize the impact of their visit on the precious natural wonders they hope to protect. Let’s start by defining exactly what ecotourism is. Not just any trip to the great outdoors can be classified as ecotourism, and not any hotel on the beach is an ecotourist destination. The primary goal of ecotourism is to promote travel to unspoiled natural resources, while also minimizing the impact of visitors on those natural resources and providing jobs to local populations. Ecotourism must help conserve cultural and biological diversity through ecosystem protection, while promoting sustainable use of biodiversity. The positive economic impact of ecotourism must be shared with local communities. In addition, local communities must be informed, give consent, and participate in the management of ecotourist destinations. Ecotourism destinations must also prioritize affordability, while minimizing waste in the form of luxury accommodations. And the main attractions promoted by ecotourism must focus on local culture, flora, and fauna. Since travel impacts environments and communities, ecotourism supports travel providers that make every effort to ensure their activities aren’t detrimental to the local and global environment. To make sure you’re doing business with an ecotourist provider, be sure to do your homework on the company’s practices. Answering these questions can help you be better informed about the impact your travel decisions will have on the local community and the planet. How much does the company work with the local community? Do they support local conservation projects, or contribute to local education? For hotels and other facilities, is the building LEED certified? So you’ve planned your ultimate ecotourism road trip. Now it’s time to pack. Here are some simple pointers for efficient and responsible ecotourism packing. Save money, pack light: Pack items that can be washed in a sink or that you won’t mind wearing repeatedly. 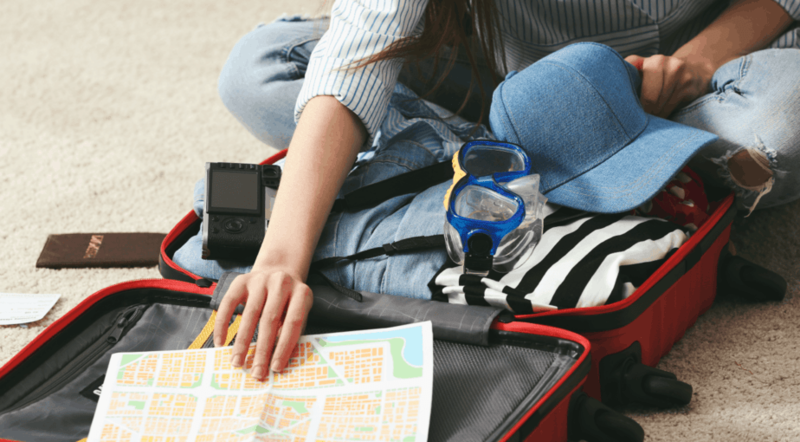 (If you’re flying, packing light will also help you save money in baggage fees.) Don’t ask yourself what you need “just in case,” ask what you can do without. Take only one bag: Keep your bag under 20 lbs, and remember that you might have to carry it for great distances, so make sure it’s comfortable. Support the local economy: Instead of packing something, find out if you can source it locally wherever you’re headed. Locally made goods are often sustainably produced. In addition, your luggage will be lighter, and dollars spent at your destination will help support the local economy. Once you’ve reached your destination, there are many things you can do to be a responsible steward of the environment, while still enjoying the natural beauty you came to see. Take short showers: Help save water by taking short showers, and by turning off the faucet while brushing your teeth. Turn off the lights: Lights, heat/AC, TVs, and computers guzzle a lot of energy. Leave them off whenever possible. Put that “Do Not Disturb” sign on your door to let housekeeping know cleaning your room can wait for another day. Reduce, reuse, recycle: Just like at home, follow the 3 “R’s.” Bring a refillable BPA-free water bottle. Ask yourself, does that bath towel really need to go in the laundry? Limit yourself to one bar of soap for the sink and shower. Carry out all your recyclable trash, and keep all visitor collateral (maps, brochures, etc.) reusable for the next person. Use public transportation: Public transportation at full capacity, like buses and trains, produces fewer emissions than flying. But if you must fly, choose new planes traveling busy routes. Flying direct cuts down on excess emissions created by takeoffs and landings. Consider purchasing carbon offsets. Practice “Leave No Trace” ethics: Bring along a bag to pick up or carry out trash. And as much as possible, refrain from touching, marking, or moving any native flora. There you have it. You’ve earned your green star. You’re a well-informed and well-prepared ecotourist. Now let’s take a look at America’s 20 best ecotourist destinations. When compiling this ranking, we imagined an epic road trip, starting in California and ending in Florida. In doing so, we searched high and low for parks, cities, states, organizations, and more — all sorts of amazing ecotourist destinations to see along the way. Did it make sense in the routing of our road trip? Is there an abundance of ecotourist attractions in the region? Is there a good selection of eco-lodging for travelers to choose from while visiting? Is there broad community support for ecological initiatives in the area? 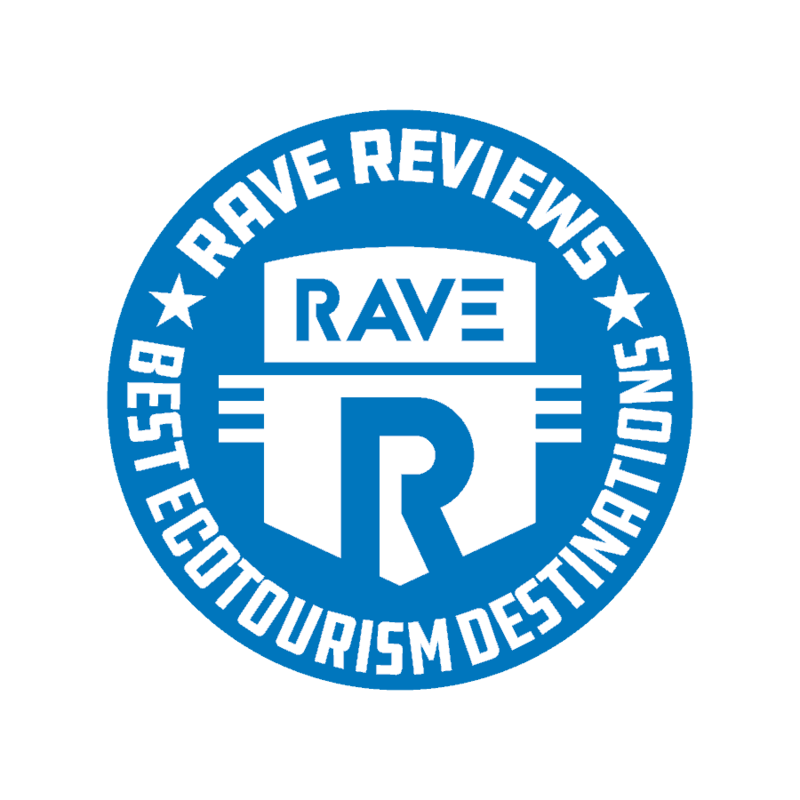 So while you power up your Prius, sit back and enjoy RAVE’s ultimate American ecotourist road trip. 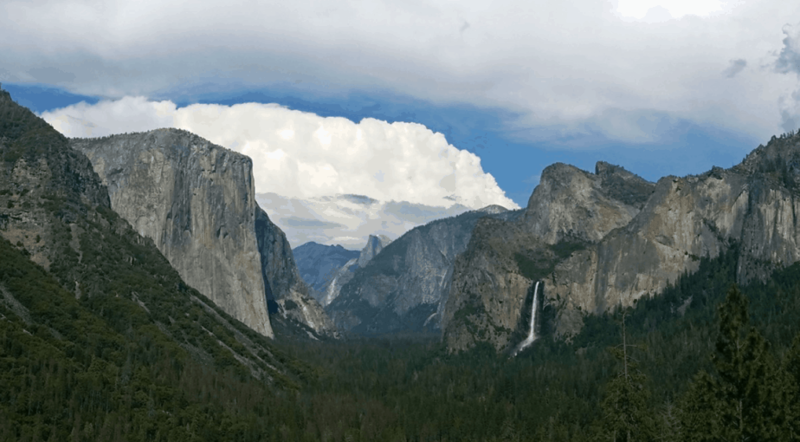 Begin your ultimate ecotourism road trip at Yosemite National Park. With nearly 1,200 square miles of amazing mountain scenery, Yosemite is a great ecotourism destination, with soaring cliffs, dramatic valleys, free and open wilderness, enormous sequoias, and epic waterfalls. Visit Yosemite in the fall, and you’ll enjoy the park’s vibrant autumn colors. While you’re there, you can camp, hike, and ride horses or bikes. In the winter, snow enthusiasts love to ski, hike, snowboard, or ice skate. As the weather turns warm in the spring and summer, the ice thaws in Yosemite, and the waterfalls spring back to life. During these warmer months, you’ll enjoy hiking, camping, boating, bike riding, horseback riding, or engaging in water sports. One way to minimize your carbon footprint while visiting Yosemite is to walk or bike as much as possible instead of driving around the park. Bring along a bag or fanny pack to carry out your trash, and cut back on garbage altogether by bringing your own reusable water bottle and avoiding single-use packaging, like Ziploc bags. The best lodging option for ecotourists visiting Yosemite is to camp or reserve a cabin inside the park, which cuts down on time spent driving and reduces your carbon footprint. 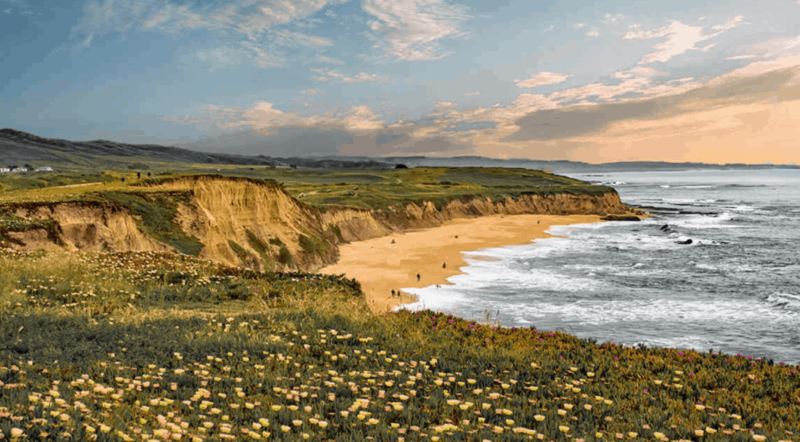 Staying in California, set your course toward Half Moon Bay, a charming seaside community just 40 minutes south of San Francisco, nestled in the Santa Cruz mountains near the Pacific Ocean. There’s a lot for an ecotourist to do and see in Half Moon Bay, including marine reserves and wetlands, small farms, a working harbor, parks, hiking trails, and bird refuges. 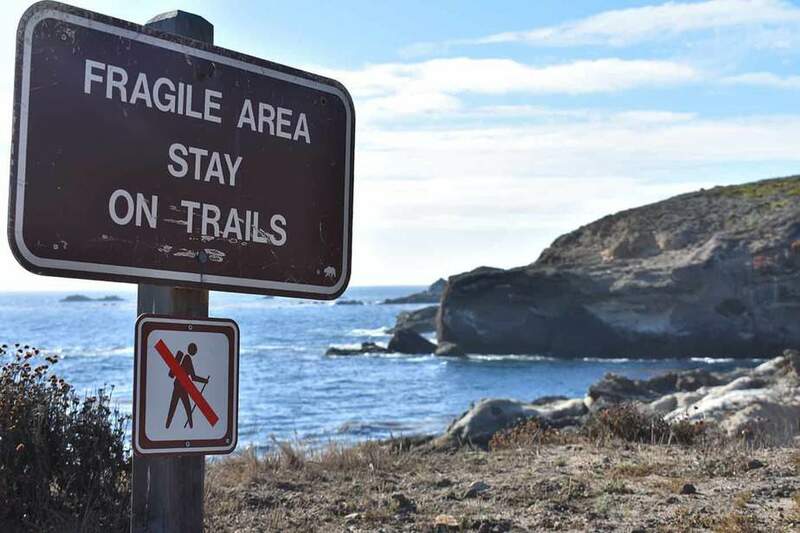 In fact, ecotourism is so important to the area that the Half Moon Bay Coastside Chamber of Commerce and Visitors’ Bureau launched California’s first ecotourism visitor program. Simply pick up the Ecotourism Map to find out about all of the hands-on things to do in Half Moon Bay, such as winery tours, kayak trips, fishing, and whale watching. That’s in addition to the region’s many eco-friendly lodging facilities, farm tours and stays, and any number of beaches and parks. Offering cabins, tent bungalows, and a KOA campground, Costanoa is a great place to experience undisturbed beaches, 4 nearby state parks, and 30,000 acres of walking trails. From Half Moon Bay, head due north to Oregon. 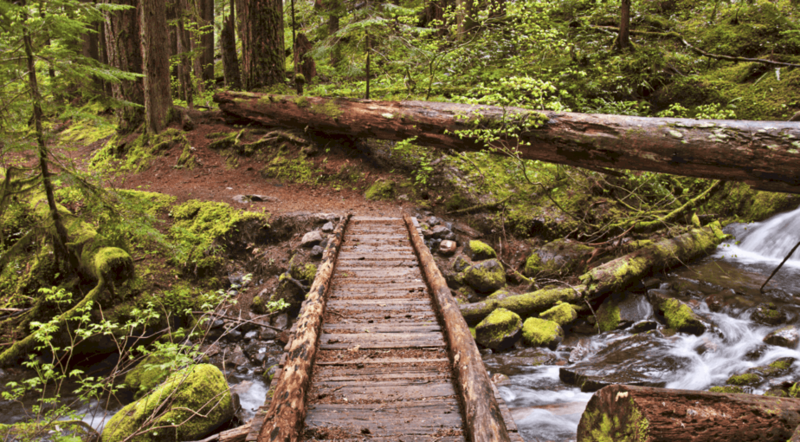 With abundant natural beauty and a long history of conservationist policies, Oregon has a lot to offer you on your ecotourism road trip. Start this leg of your trip in Portland. It’s a model for eco-friendly urban planning, with excellent public transit, a multitude of bike lanes, and numerous LEED-certified buildings. In fact, Travel Portland is rare among tourism organizations: It’s one of the few in the country with a public relations manager dedicated solely to environmentally responsible tourism. 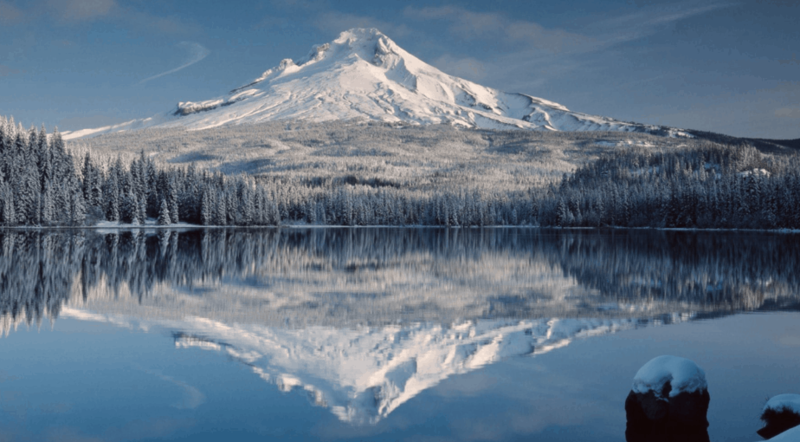 Outside Portland, Oregon’s 6 ski areas are all members of the SkiGreen Program, a partnership between the winter sports industry and the Bonneville Environmental Foundation (BEF) to promote and support renewable energy sources like wind and solar power. Beyond that, there are eco-friendly things to do and see all over the state — from Mt. Hood and Mt. Bachelor to the Three Sisters, Crater Lake, and the Deschutes National Forest. Certified by the National Wildlife Foundation as a habitat for wildlife, WildSpring Guest Habitat in the Oregon coastal region offers energy-efficient lighting, heating, and cooling as well as low-flow toilets and showers. After leaving Oregon, keep north to Washington State, home to Mount Rainier National Park. Mount Rainier is one of Washington State’s most popular destinations for ecotourists. 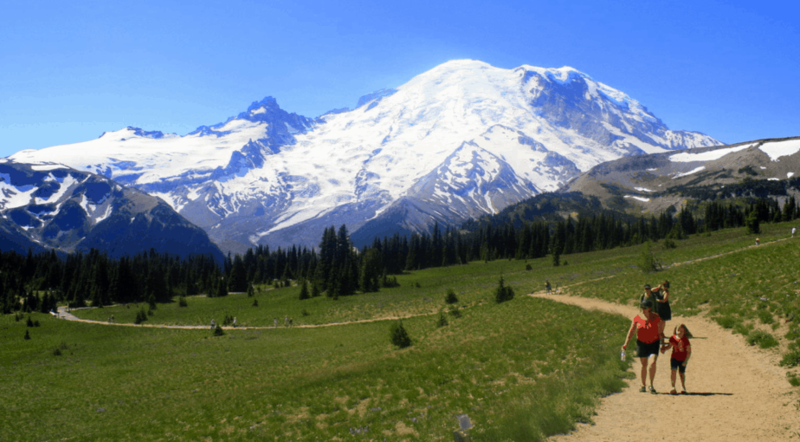 The main attraction is, of course, Mount Rainier, but there are also valleys, waterfalls, and sub-alpine meadows to explore. There are over 90,000 acres of old-growth forest, and over 25 glaciers surrounding the majestic volcano. Recently, Mount Rainier has instituted a number of new sustainability practices, including environmental analysis on construction and design projects, the use of a hybrid solar energy system in the park’s White River area, and a focus on using new “green” products as they are developed. In addition, Mount Rainier has pledged to reduce consumption of resources by reusing and recycling products. While in the park, be sure to visit Paradise. With an inn and visitor’s center, Paradise is a great jumping-off point for wildflower viewing in the summer and snow activities in the winter. Be sure to hit the Nisqually Vista Trail, a 45-minute loop with views of Mount Rainier and the Nisqually Glacier. While in Washington State, stay at Suncadia Resort, which holds 3-Star Built Green Community status. In 2009, Suncadia earned the Environmental Achievement Award from the Pacific Northwest Section of the Air and Waste Management Association. From Washington State, head east to Yellowstone, America’s oldest national park — and one of the busiest. Visitors sometimes “love the park to death” with cars, crowds, and garbage. This makes it especially important to abide by ecotourist practices when you visit the park. At an immense 2.2 million acres, Yellowstone has several distinct regions and habitats, with geothermal features like geysers and fumaroles, as well as limestone terraces, a canyon, a lake, and an abundance of amazing wildlife. There are lots of ways to responsibly enjoy all that Yellowstone has to offer. Yellowstone concessionaire Xanterra Parks & Resorts sources all its food locally and sustainably. It has instituted a recycling and composting program, and has undertaken steps to reduce water and energy use. If you really want to get into the wild, go off-grid on an overnight backpacking trip inside the park. But before you go, check out the Leave No Trace site for pointers on how to leave a campsite better than you found it. Old Faithful is a popular attraction at Yellowstone. To beat the crowds, head to the Upper Geyser Basin early in the morning, or late in the afternoon. Another option is to book a guided tour on the 136-square-mile Yellowstone Lake, or to explore Lamar Valley. With so many hiking and sightseeing opportunities, ecotourists visiting Yellowstone will never be at a loss for things to do or sights to see. 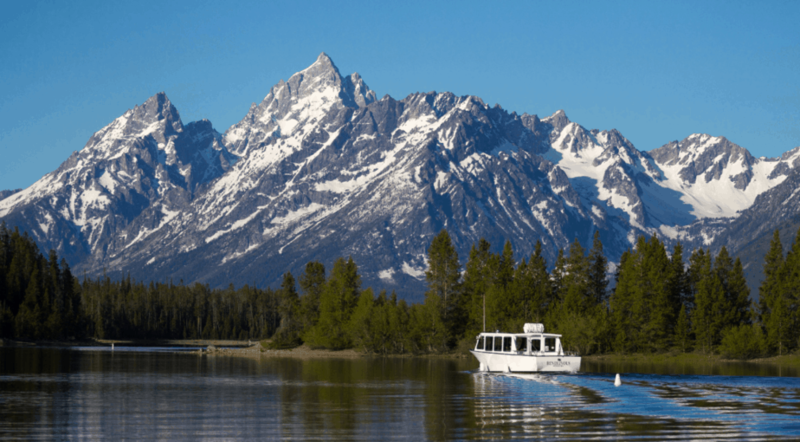 About 20 miles south of Yellowstone, you’ll find Grand Teton National Park and the Grand Teton Lodge Company. Ecotourists will appreciate the lodge’s Sustainable Stay Pledge. Take the pledge and receive a slight discount on your room. From Yellowstone, drive south to Utah, a place of unbelievable natural beauty and a must-see stop on your ultimate ecotourism road trip. 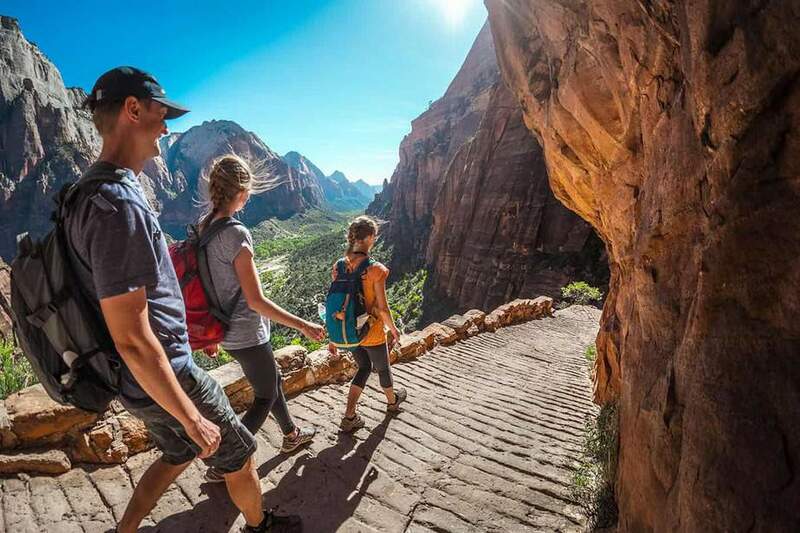 When in Utah, choose from Canyonlands and Zion National Parks, the Great Salt Lake, or the Wasatch Mountains. When the weather turns cold, head to any one of Utah’s world-class ski resorts. There’s also Arches National Park, and in northeastern Utah, Dinosaur National Monument, where 1,500 dinosaur bones are embedded and on display in an excavated mountainside. Also in Utah is Lake Powell, the second-largest manmade reservoir in the U.S., attracting approximately 2 million visitors per year. The town of Moab continues to be a popular destination for ecotourists, centrally located near Canyonlands and Arches National Parks. Visitors also find abundant wildlife and a variety of ways to appreciate the great outdoors at Antelope Island State Park, located in the southeastern part of the Great Salt Lake. 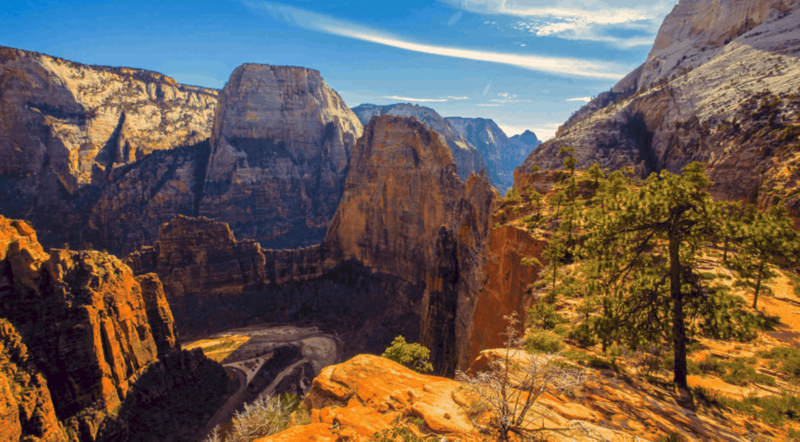 Stay in 4,000 acres of high desert plateaus and Ponderosa pines at the border of Zion National Park. Continue south and head to Colorado. No ecotourist road trip would be complete without a stop in this beautiful and diverse state. In fact, get a map of Colorado and throw a dart — odds are you’ll hit a great destination for ecotourism. Here are only a few of the best. 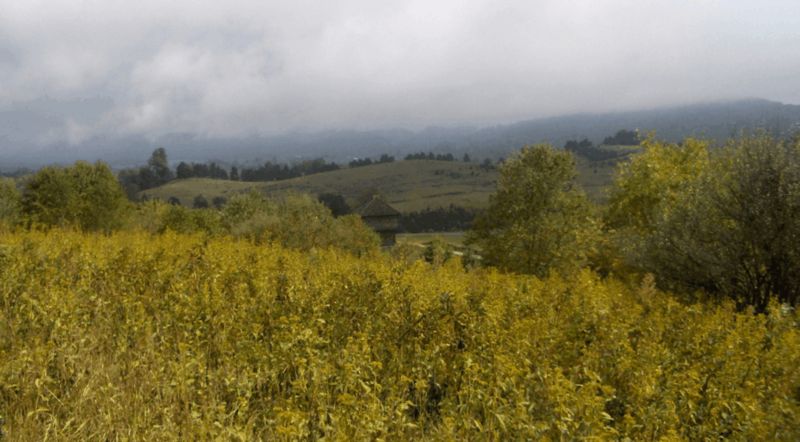 In Weston, CO, there’s Indigenous Roots LLC, offering an immersive living history experience, with interactive classes on history, human geography, ecology, and cultural anthropology. Visit the Garden of the Gods Visitor and Nature Center in Colorado Springs. Enjoy guided or unguided tours, nature talks, bird watching, and hiking at the crossroads of several ecosystems, including the plains, foothills, and mountains. In Avon, there’s the Walking Mountains Science Center, where visitors can explore nature while learning about the wonders of the mountain ecosystem through natural science and sustainability programs. Colorado is also home to several state and national parks, including Rocky Mountain National Park, Great Sand Dunes National Park, and Mesa Verde — where 600 mountainside cliff dwellings, first occupied by the Ancestral Pueblo people more than 1,000 years ago, are preserved to this day. Another unique attraction for ecotourists in Colorado is the state’s numerous sustainable hemp and cannabis farms, such as Hemp Farm Colorado LLC, Green Acres Hemp Farm, or the Whole Hemp Company. Located in beautiful Vail, CO, The Wren received the “Good Earthkeeping Award” from the Colorado Hotel Lodging Association in 2014, and it was named the Vail Valley Partnership “Green Property of the Year” for 2015. 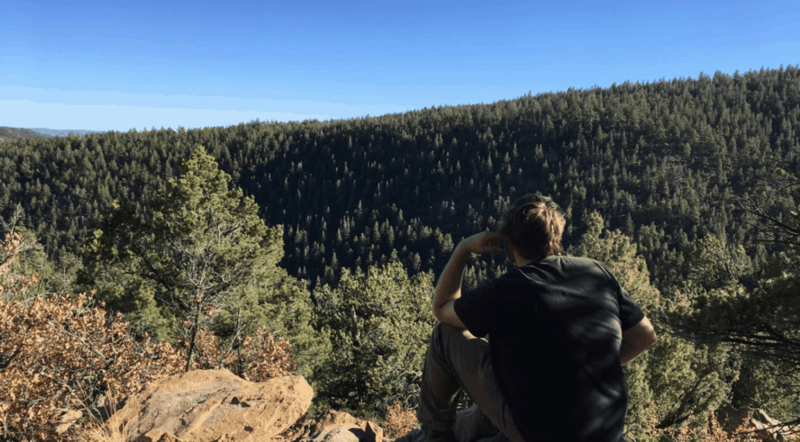 Staying due south, head to New Mexico. With 30 million acres of public land and all sorts of archaeological treasures and unique geological formations to see, New Mexico has a lot to offer visiting ecotourists. While in the Land of Enchantment, see untouched wilderness in the Bosque Del Apache National Wildlife Refuge, home to tens of thousands of sandhill cranes every winter. 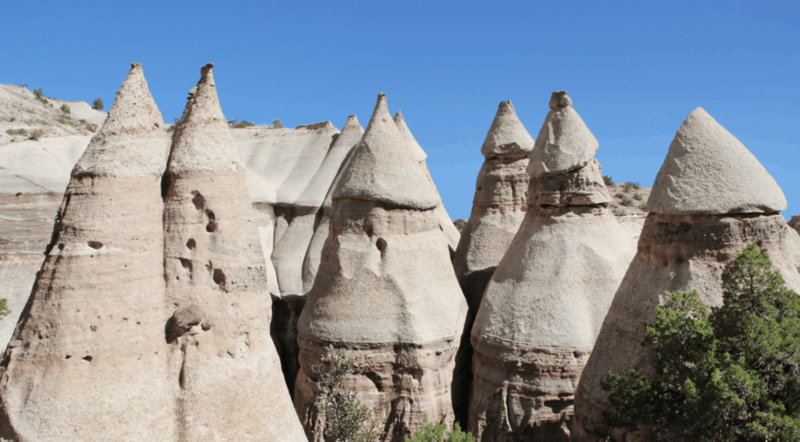 Visit Kasha-Katuwe Tent Rocks National Monument, where you’ll see teepee-like volcanic formations, estimated to be about 7 million years old. New Mexico also offers opportunities to visit, tour, or volunteer on small, working farms practicing sustainable agriculture, such as Pistachioland. Home to over 12,000 pistachio trees and 14 acres of grape vines, Pistachioland is an educational and fun ecotourist destination. New Mexico honors its Native American heritage in many ways, one of which is Chaco Culture National Historical Park, where the ancestral Pueblo civilization once thrived. While there, you’ll see structures built over 1,000 years ago. Visiting ecotourists also love rafting the Rio Grande. You can choose to brave the rapids, or stick to the calmer areas of the river while a guide tells you about geological features, pointing out unique plant and animal life along the way. Located in Taos, NM, Casa Gallina participates in the Kit Carson Electric Cooperative’s Green Power Program. This means pollution-free wind energy credits were purchased to offset your electrical use during your stay. From New Mexico, continue southeast to Texas — a great stop on any ecotourism road trip, particularly if you’re a birder. Your first piece of business when planning an ecotourism excursion to Texas should be to visit the Texas Parks and Wildlife website. You’ll find all kinds of information on great birding trails across the Lone Star State. Be sure to stop by the World Birding Center, located in the lower Rio Grande Valley. It’s a fantastic source for information on birding events all over Texas. The center will tip you off to birding-themed tours, as well as sites of interest for birders, like the 50-acre South Padre Island Birding and Nature Center. Another not-to-miss area of Texas, perfect for ecotourism, is the Texas badlands. Here, you can see cacti and spot all sorts of varmints just like a real cowboy. You also won’t want to pass up a chance to see the beautiful Texas hill country. Elsewhere in Texas, there’s South Padre Island’s Sea Turtle Inc. Tour the facility and learn about endangered turtles, as well as efforts to save them. With a wide range of topography and a varied climate, Texas is a hot spot for ecotourism. A full-service nature resort with a nearly 1,000-acre private nature park, Canyon of the Eagles is a refuge for the endangered Black-Capped Vireo, Golden-Cheeked Warbler, and American Bald Eagle. After your time in Texas, head slightly northeast to Missouri, where you’ll hit plenty of great and unexpected destinations for ecotourism in and around the Ozark Mountain region. Begin by visiting the Springfield Conservation Nature Center in Springfield, MO. While there, enjoy free conservation-themed activities, perfect for the whole family. See nature exhibits, attend educational programming, purchase hunting and fishing permits, or shop the nature-related gift shop. And outside the center, visitors can explore 3 miles of hiking trails. Another unusual ecotourist destination in the Ozarks is the Smallin Civil War Cave. Artifacts dating back 9,000 years have been found there. More recently, the cave’s history includes the Trail of Tears and the American Civil War. Several tour options are available, one of which takes visitors back to the time of the Civil War. Lit only by lantern, this tour allows you to see the cave through the eyes of those from a time long gone by. And for the truly adventurous, there are Off-Trail Wild Tours. Go deep inside the cave, tread through knee-deep water, and spot all sorts of rare cave species. Located in the Arkansas Ozarks, Red Bud Valley Resort is a great place to be at one with nature in a beautiful and rustic 180-acre valley. Not all ecotourism has to take place out in the middle of nowhere. From Missouri, set your course north to Chicago — one of America’s biggest cities. 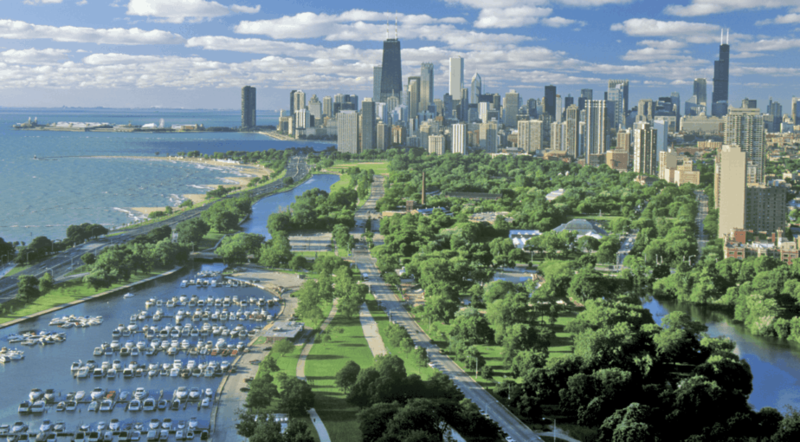 The Windy City has recently emerged as a leader in ecotourism and other environmental initiatives, such as the “green” roof on the top of City Hall, and the appointment of a Chief Environmental Officer to the mayor’s staff. When there was an addition to Chicago’s McCormick Place Convention Center, it became the largest new-construction building to receive LEED certification. Bike lanes now crisscross the city, and Chicago’s Millennium Park has ample bike parking, as well as showers for bike commuters. The city’s Green Hotels Initiative encourages local hotels to become more energy efficient while minimizing environmental impact. In fact, the environmental nonprofit organization Green Seal has certified many Chicago hotels for promoting energy savings, minimizing waste, and conserving water. And with one of America’s best food scenes, Chicago restaurants have fully embraced principles of ecotourism, focusing their menus on seasonal ingredients and sustainable practices. Green Seal-certified, Hotel Allegro blends mid-century style with a modern twist. This is a great place for ecotourists to stay while responsibly experiencing everything Chicago has to offer. From Chicago, head east to northern Ohio and the shores and islands of Lake Erie. A surprisingly vibrant destination for ecotourists, this region offers diverse ecosystems, evidence of glaciers, and a whole lot more. 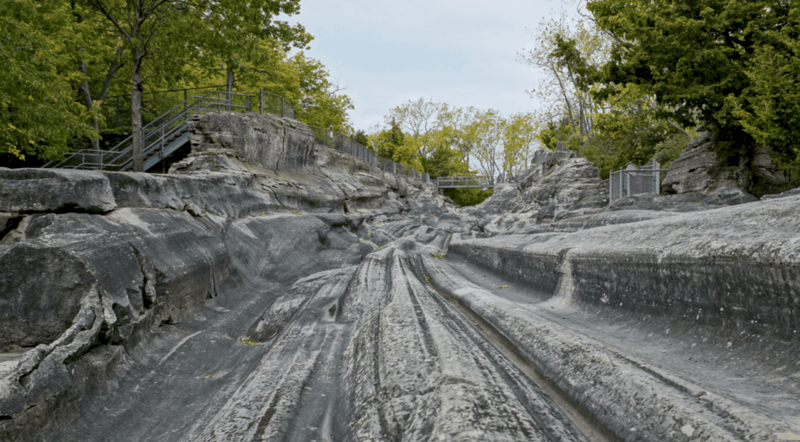 The first stop for any ecotourist in northern Ohio should be the Glacial Grooves on Kelleys Island. While you’re there, see the 18,000-year-old imprint of glaciers on ancient limestone. Stay the night at the nearby Kelleys Island State Park campground and public beach. Next, head to Gibraltar Island, where you’ll find an actual castle — Cooke Castle. The 15-room residence is the former home of 19th-century investment banker Jay Cooke. The castle is now owned by Ohio State University. Tour the island, view even more glacial grooves, and take in the view from Perry’s Lookout — a strategic position in the War of 1812. Then head to the Aquatic Visitors Center in Put-in-Bay. See Lake Erie’s tiniest inhabitants, and learn all about Lake Erie’s native fish populations in the center’s aquariums. Finally, make your way to Old Woman Creek, one of Ohio’s last remaining natural estuaries. There, you’ll find marshes, swamps, upland forests, tributary streams, open water, and a barrier beach, as well as an array of native plants and animals. While in Ohio, rent a spacious tent at Eco Camp. Comfortably sleeping up to 4 people, Eco Camp tents are a perfect jumping-off point for kayaking Ohio’s Maumee River or biking on the Wabash Cannonball. Due east from Ohio is Pennsylvania, the next stop on your ecotourism road trip. From big cities to the Appalachian Trail, you’ll find many ways to enjoy the state as a responsible ecotourist. In Hawley, PA, stay at the Ledges Hotel, a member of the Green Lodging Partnership with the Delaware Highlands Conservancy. Here, guest rooms are decorated by the work of local artisans and the all-natural toiletries are made from organic ingredients. You might not expect attending a hockey game to be on the itinerary of an ecotourist road trip. But the home of the Pittsburgh Pirates, Consol Energy Center, has the distinction of being the first National Hockey League arena to achieve LEED Gold Certification. 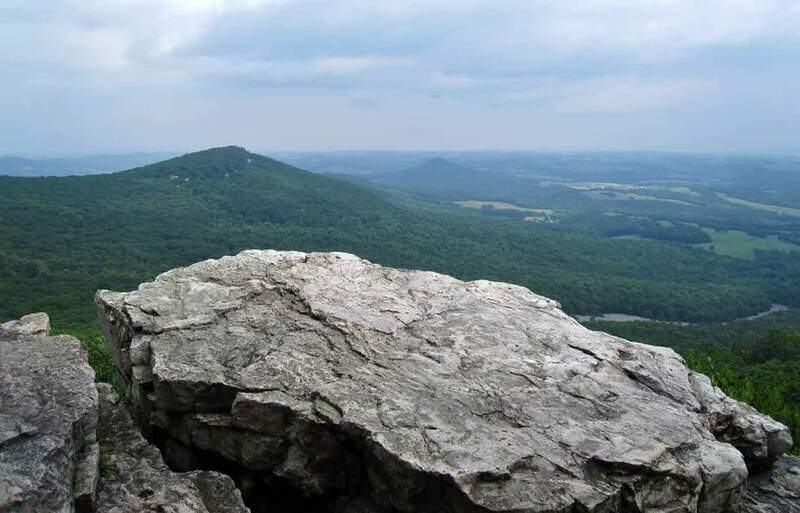 Try the Hyner View Trail, which includes 3 major climbs, 3 major descents, and more than 4,300 feet in elevation gain. The hike offers great views, stream crossings, and single-track paths. Last, visit Boiling Springs Appalachian Trail Information Center, the perfect starting point for day hikers, thru-hikers, and section hikers. All maps and merchandise purchased there support the Appalachian Trail’s initiative. Experience all the spectacular wildlife and flora of the region with the Allenberry Resort and Playhouse as your home base. Be sure to check out the resort’s fly fishing school! Workshop subjects offered at the Omega Institute cover a broad range of subjects, including sustainability. Other recent topics have included ecological literacy, how to support community agriculture, and educating for a sustainable future. When visiting the Omega Institute, be sure to check out the town of Rhinebeck. 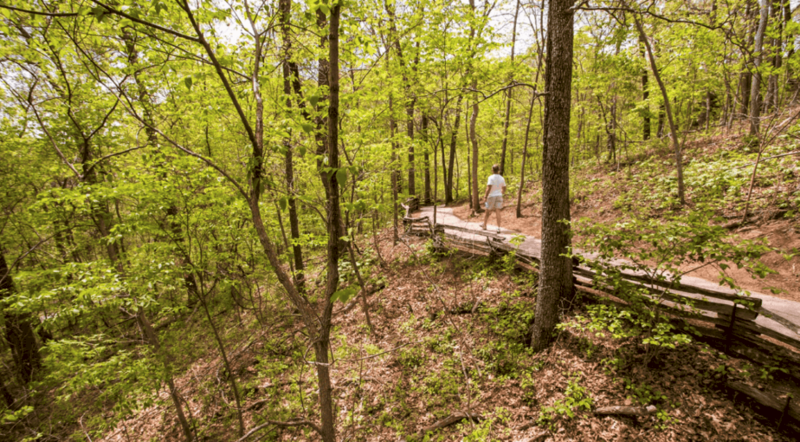 Head to the Ferncliff Forest, where you’ll find a 200-acre forest known as one of Hudson Valley’s best old-growth forests. Ferncliff is open year-round for hiking, camping, mountain biking, skiing, fishing, and picnics. Hike Ferncliff’s 4 miles of trails and see the remains of hand-dug wells, cisterns, root cellars, and old foundations. The Omega Institute offers a variety of lodging options for all sorts of budgets, ranging from camping to private cabins. Your next stop on our ultimate ecotourism road trip is the beautiful state of Maine, where the state’s Department of Environmental Protection encourages all sorts of ecotourism. So you’ll have your pick from all sorts of sustainable local businesses to support, as well as environmentally conscious properties and operators. In fact, the Maine Woods Initiative, developed by the Appalachian Mountain Club, is a land conservation strategy intended to promote the protection of ecological and economic resources, sustainable forestry practices, and community partnerships. The region of Maine known as DownEast Acadia is a particularly great spot for ecotourism. While touring the area, check out the Maine Birding Trail, where you can see puffins, Common Murres, Razorbills, Black Guillemots, Great Cormorants, and Roseate Terns. 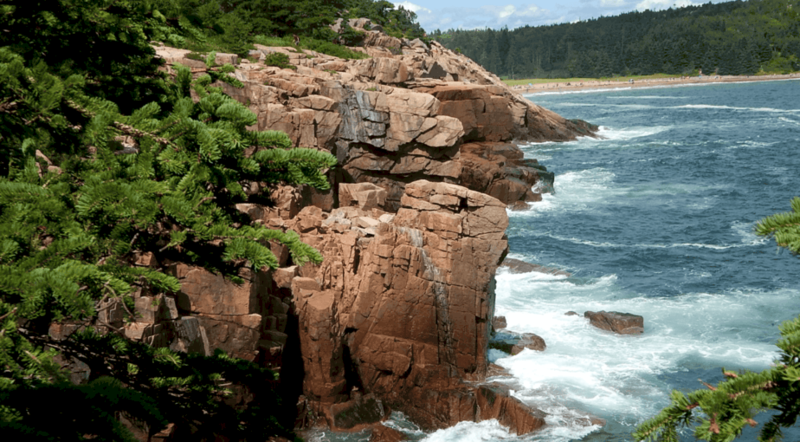 Don’t leave Maine without visiting Acadia National Park, home to the highest rocky headlands along the Atlantic coastline of the U.S. You’ll also find a variety of highly biodiverse habitats and a rich cultural heritage. The park is home to 7 peaks above 1,000 feet, 158 miles of hiking trails, and 45 miles of carriage roads with 16 stone bridges. This is a LEED-certified hotel practicing a long list of eco-friendly initiatives, including the use of recycled building materials, local produce for the restaurant, and solar heating for the pool. Arcadia Center for Sustainable Food and Agriculture | Washington, D.C.
From Maine, we turn south to our nation’s capital, where, in addition to the usual tourist attractions, ecotourists can find plenty of green and sustainable ways to tour the city and region. American University is one of D.C.’s greenest destinations, featuring buildings outfitted with solar panels, a gray water system, electric vehicle chargers, and green roofs. In addition, there’s a farmer’s market every Wednesday. Elsewhere in D.C., there’s the Arcadia Center for Sustainable Food and Agriculture, with a mobile market that brings farm-fresh food directly to the people on an old converted school bus. Arcadia also offers farm camps for students. To get up close and personal with D.C.’s historic sites, consider renting a bike or scheduling a guided tour from Bike and Roll. Try the tours through the monuments or simply around the Capitol. The U.S. Green Building Council, the people behind the LEED certification, is a great stop for ecotourists in the D.C. area. Book a tour and see the building’s interior waterfall! Do something different and stay simply at a hostel, where you’ll find shared and private rooms located at the center of everything D.C. has to offer. From D.C., continue south to Virginia, the next stop on our ultimate ecotourism road trip. 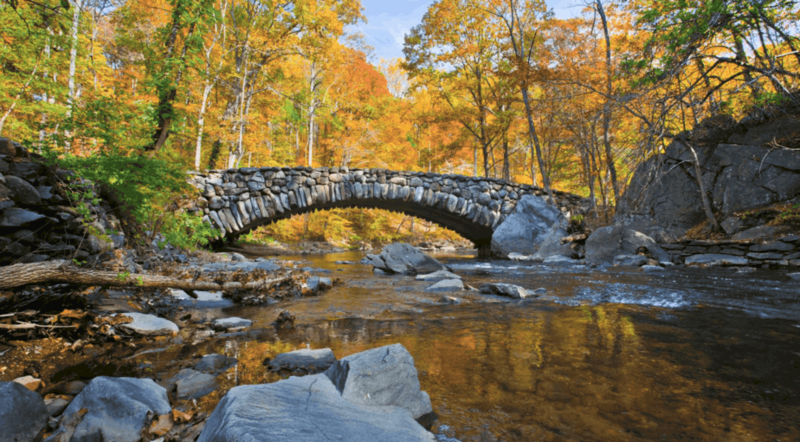 Virginia is an especially great place for ecoutourists traveling with families. 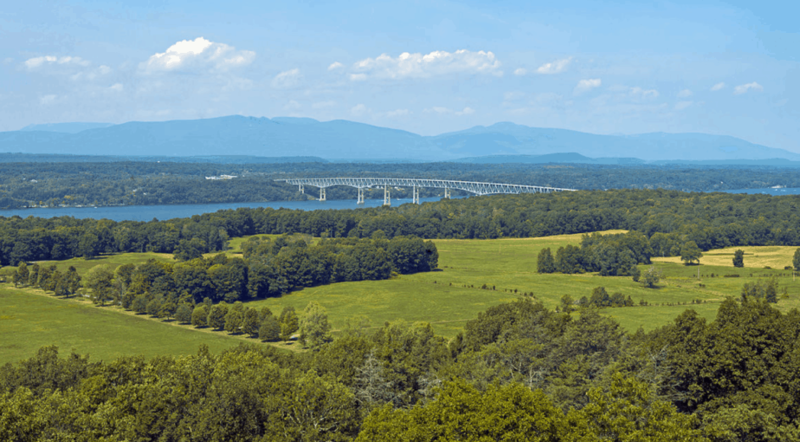 Before you reach the state line, we suggest checking out the website Virginia Green, where you’ll find green travel tips, as well as eco-lodging and dining options all over the state. 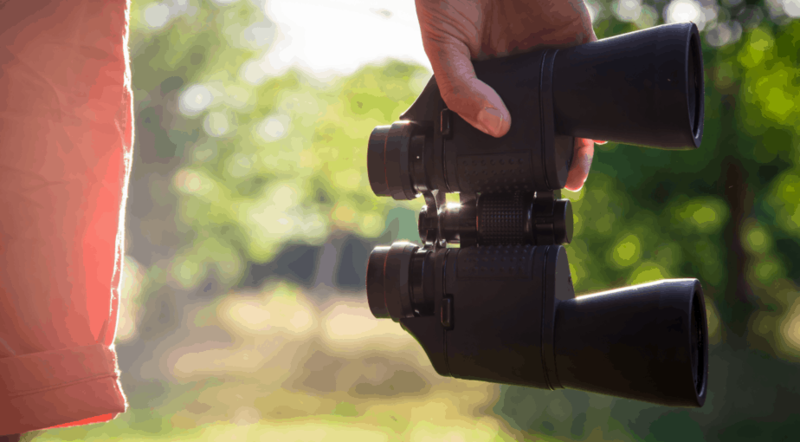 For your first stop in Virginia, we recommend the Virginia Birding and Wildlife Trail in the Shenandoah Valley. The Back Bay National Wildlife Refuge — a habitat for snow geese, ducks, loggerhead sea turtles, piping plovers, peregrine falcons, and bald eagles — is also well worth a visit. Next, try Chincoteague National Wildlife Refuge, home to 14,000 acres of beach, maritime forest, salt marsh, and freshwater marsh, as well as migratory birds and other unique wildlife. Or simply drive along Virginia’s Blue Ridge Parkway to discover all sorts of green activities and eco-attractions, like Buffalo Mountain or Rock Castle Gorge National Recreational Trail. It’s perfect for hiking, fishing, camping, and more. Mountain Lake Lodge puts an emphasis on protecting resources, promoting educational programming, and supporting ecological research, all while providing a ton of great recreational opportunities for the whole family. Carry on further south to Asheville, NC, where you’ll find several great ecotourist attractions located only about an hour from the city. In fact, while traveling from Virginia to North Carolina, you won’t even need to leave the Blue Ridge Parkway. 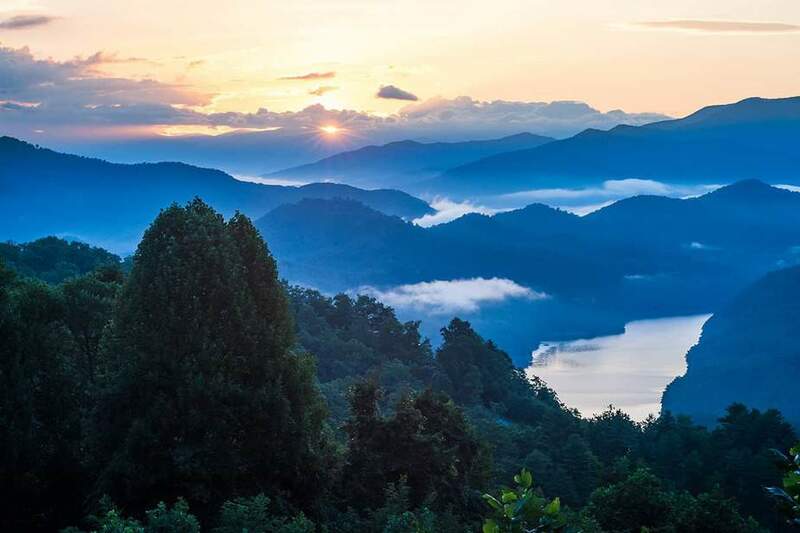 And while driving the North Carolina portion of the Parkway, you’ll see historic landmarks and might catch a glimpse of one of thousands of wildlife species. Follow the road long enough, and you’ll end up at North Carolina’s Great Smoky Mountains National Park. Be sure to visit Chimney Rock State Park. The nearly 6,000-acre park is home to amazing hiking trails, where you can see diverse forests, rare flowers, endangered animals, and a variety of rare birds. Be sure to see the 404-foot drop of Hickory Nut Falls, or ride the elevator up Chimney Rock to take in the beautiful scenery from high above. Also near Asheville is the Linville Gorge Wilderness and Pisgah National Forest. With lovely gardens, a spa, and specially filtered water, the centrally located Historic Abbington Green Bed & Breakfast Inn is a great place for ecotourists visiting the Asheville area. After leaving Asheville, stay south until you get to Georgia, home to 62 state parks and 11 national parks. Eco-friendly tourism activities at these parks include swimming, camping, hiking, biking, paddling, geocaching, birding, and orienteering. In fact, throughout Georgia, the Department of Natural Resources encourages sustainable practices to help protect the abundant natural, cultural, and historic resources all over the state. 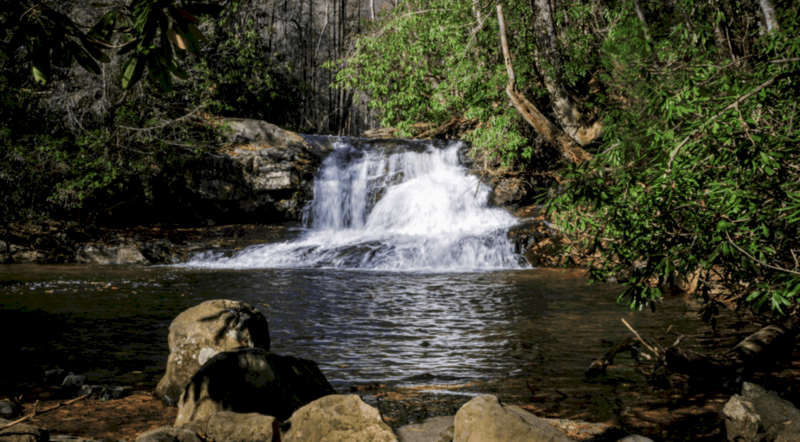 While in Georgia, hike the waterfalls at Cloudland Canyon and Amicalola Falls State Parks. Or pick up the 14-state Appalachian National Scenic Trail again as it winds through Georgia’s Chattahoochee National Forest. Or encounter wildlife at Okefenokee National Wildlife Refuge in southern Georgia. Harris Neck National Wildlife Refuge, part of the Colonial Coast Birding Trail, is a great place to see nearly 3,000 acres of diverse habitat. Cumberland Island National Seashore, Georgia’s largest barrier island, offers options for paddling rivers, marshes, and coastal areas. And while you’re there, sign up for interpretive programs exploring island heritage, biodiverse habitats, and bird nesting areas. This is a convenient and affordable option for those looking to explore the Suwannee River and Okefenokee Swamp. 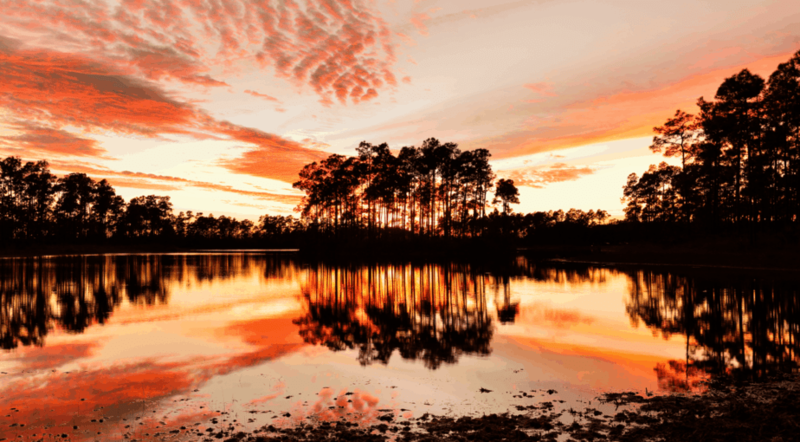 Our ultimate ecotourism road trip ends at the Florida Everglades, an important ecosystem for millions of Floridians, who source their drinking water from the river, as well as all sorts of wildlife that rely on the area for survival. While you’re there, you can see alligators, crocodiles, exotic tropical birds, and some of the most unusual plant life anywhere in the U.S.
And rest assured, the impact of your visit to the Everglades will be minimal. Principles of ecotourism aren’t just an option for those providing travel amenities in the Everglades — it’s the rule. 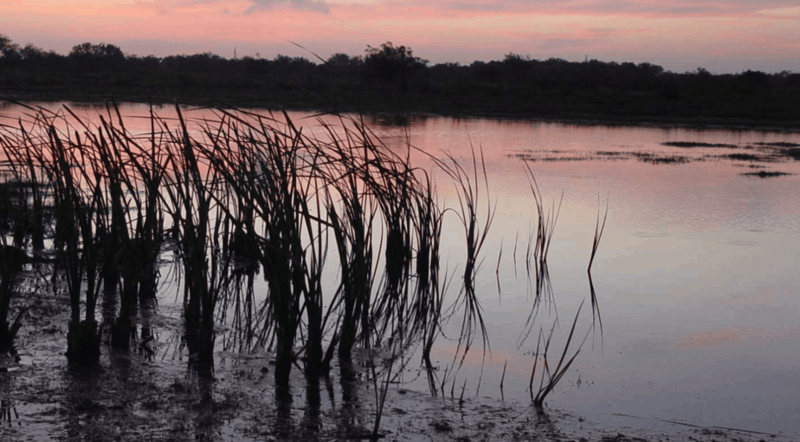 In 2010, the Comprehensive Everglades Restoration Plan launched several restoration initiatives. The objective of these plans is to return some areas of the Everglades to their pristine natural condition. A great way to see the Everglades is by booking a kayak tour with Garl’s Coastal Kayaking Everglades. With Garl’s, you’ll see the region through the eyes of naturalists and tour guides as they show you the beauty and adventure in one of America’s best eco-tourist destinations. With a modern, eco-friendly atmosphere, Ivey House is Collier County’s first “Certified Green Lodging” location.